Sandy River at the Foot Bridge. 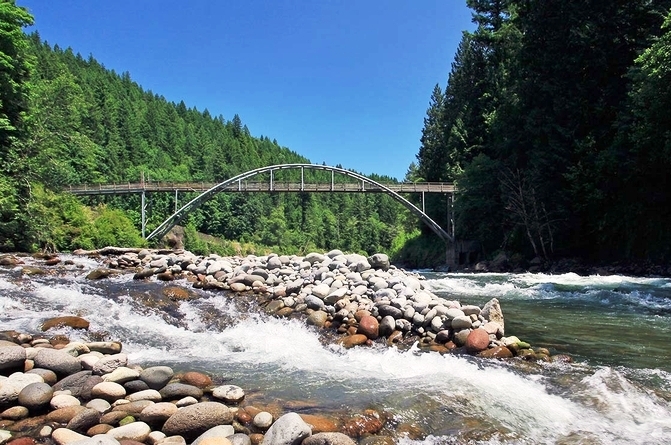 Sandy River is Approximately 56 miles long origination in Mount hood and draining out into the Columbia river. The Sandy is primarily known for its fall Chinook runs, but offers up some excellent Steelhead and Coho fishing opportunities as well. Access is somewhat limited but still well worth the effort. For details on Sandy river fishing access see our Sandy river fishing access map below. From the mouth to the confluence of the Salmon river Hatchery Chinook retention is generally allowed from February through October. Hatchery Coho and Steelhead are open year round. One single point barbless hooks required for Salmon and Steelhead. Corky and yarn, Jigs or spinners all work well on this river. Salmon Eggs, Sand Shrimp, Worms.